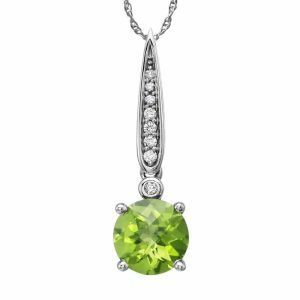 Peridot, the birthstone for August, is one of the few gemstones to occur in one color, naturally – olive green. 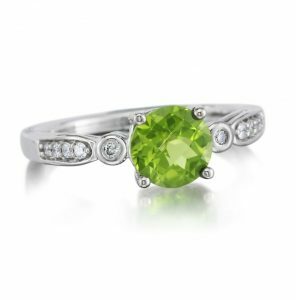 Peridot is believed to be derived from a Greek word “peridona”, meaning giving plenty. 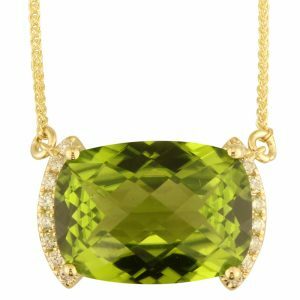 The intensity of the color and its brilliant lime green glow depends on the amount of iron in the crystal formation. Peridot is associated with prosperity and good fortune. I needed to get my wedding ring resized after having a baby. I didn’t want to go to a mall jeweler and have my ring shipped off to who knows where after all of the articles I’ve been seeing. The store is narrow but immaculate and their displays are beautiful and eye-catching. My ring took a week to be resized in-house by their jeweler and I took a lot of solace in the fact that it never left the store. I think their pricing is fair. I am more than willing to pay their prices knowing I’m supporting a local business who will treat my prized possessions with the utmost care.